The Madhura Utsav was celebrated in a grand manner over the weekend of June 11-12, 2011 in Milwaukee in the presence of the Holy Padukas of our Guru Maharaj His Holiness Sri Sri Muralidhara Swamiji. Sri Ramaswamyji had flown in from California, Sri Narayananji from Boston, and families had come from Chicago and Michigan to participate in the Utsav along with the Milwaukee devotees. 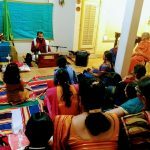 At around 8:00 am, a satsang was conducted at the residence of Sri Raju Ramamurthi at New Berlin, WI. Sri Ramaswamyji beautifully discoursed on Ambarisha Charitram and highlighted the Bhakti and humility of Ambarisha, also narrating a few experiences with our Swamiji. At 11 am, a satsang was conducted at the residence of Sri Hari Krishna and Smt. Aparna Hari at Waukesha, WI. 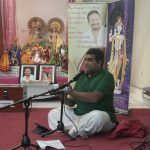 In this satsang, Sri Narayananji spoke on the greatness of Mahans. 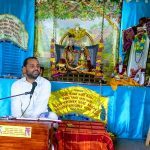 He narrated the story of Sabhari from Valmiki Ramayana, and went on to speak on how the concept of Guru can transform one completely, even without his knowledge. Later in the afternoon, little kids had assembled at the Main hall of the Hindu Temple of Wisonsin for their weekly “Krishnalaya” – Gopa Kuteeram celebrations. Mrs. Priya Thulasi, who leads the program, teaches the children bhajans, slokas and kirtans. It was Ekadasi day and the Swathi star was already in the ascent. 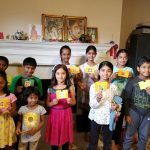 Being the star of our Guru Maharaj, a celebration was conducted at the residence of Shri Thulasi and Mrs. Priya Thulasi at Peewaukee, WI. At 6:30 pm, the Divine Padukas of Sri Swamiji were decorated under a ‘poo pandhal’ – canopy made of a large number of flowers strung together. Sri Narayananji spoke on the greatness of Satsang. Following this, Sri Ramaswamyji spoke His blissful experiences with Guru Maharaj. This was followed by Dinner Prasad, following which Bhajans and Sri Swamiji’s kirtans were sung, marking the Swathi day. The day ended with Dolothsav. 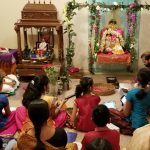 At around 9:15 am on Sunday, June 12th, a satsang was organized at the Hindu Temple of Wisconsin – where Sri Narayananji spoke on the topic – “Bhagavatam – the Supreme Preceptor”. During the discourse, the message that Bhagavatam gives us, was discussed in detail, and the talk concluded with the simple and beautiful formula that Bhagavatam gives us for a happy and delectable life. At around 11:00 pm, the Paduka Pravesham of “Krishna Graham” – the residence of Sri Suri and Mrs. Uma Suri – was conducted. 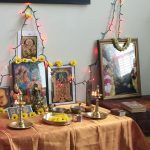 The couple, ardent devotees of Sri Swamiji, had requested the presence of Sri Swamiji for the housewarming of their new house at Brookfield, WI. Sri Swamiji gracefully accepted the invitation and had blessed them with a “Paduka Pravesham” – the presence of His Divine Padukas. Mrs. Uma Suri and Sri Suriji performed pooja to the Divine Padukas. Sri Swamiji’s “Ashirvadam” and token of love was presented to the family on this occasion. The satsang members performed Mahamantra Kirtan at “Krishna Graham” for about one hour, following which Sri Narayananji gave a discourse on Prahlada Charitram, being a Swathi day. He also spoke on the greatness of the Holy Padukas of the Satguru and the essence of Gruhapravesham. The satsang concluded with Harathi and Mahamantra Kirtan.